14 June 2006: As the United Nations reports, urban growth today is proceeding at a pace unheard of in history. Nowhere in the world is this more evident than in the cities of the People’s Republic of China. It has been described there as being part of the greatest urban-industrial revolution of all time. The policies that have fuelled this growth and evolution of Chinese cities have demonstrated that urban development is an integral feature for China’s development planners in the post-1978 reform era when market reforms were undertaken. In sheer numbers this has also produced what has been called the greatest internal migration in history, with urban migrants now sending home more money than foreign migrants of China or any other country. As reported in an article published on 14 December 2005 based upon figures released by the Consultative Group to Assist the Poor (CGAP) - a consortium of public and private agencies of the World Bank - China’s urban migrants sent home the equivalent of almost 30 billion US$ in 2005. In comparison, India (the largest recipient of foreign remittances of migrant workers) was expected to receive approximately US$22 billion by the end of the year. Not surprisingly, urban expansion in China and the systemic evolution within urban regions has been the subject of much scholarly research and debate. In essence, a system already among the most fiscally decentralized, saw further decentralization, local government empowerment and fiscal incentives that affected the dynamics of urban development by building up local economies and their revenue bases. As three Stanford University faculty members (Hehui Jin, Yingyi Qian and Barry R. Weingast) noted in their joint paper on fiscal federalism in China entitled “Regional Decentralization and Fiscal Incentives: Federalism, Chinese Style”, three principal changes have altered local governments in China since 1979. First, lower governments have assumed primary responsibility over economic matters within their jurisdictions; second, goods and factors have become mobile across localities, and local governments have engaged in inter-regional competition; third, local governments face strong fiscal incentives to pursue local prosperity as their local expenditures are closely linked to the revenues that they generate. At the same time tax rate setting remains the purview of the central government; which forbids direct borrowing by local units (leading local governments to utilize indirect borrowing vehicles that makes such borrowing more difficult to monitor from the center - which indicates that Chinese local borrowing is in need of the North Carolina (US) approach to support both sustainable and productive local borrowers). Because of the complex and evolving nature of fiscal devolution and central and local relations in that context, that topic will not be discussed here. Though the Stanford scholars were correct in pointing to the critical changes they cited for fuelling the growth of Chinese urban centers, they omitted key structural changes in urban territorial formulas (perhaps because they are not local government specialists)  namely, the application of one of the two ways that integrated federated local systems can be implemented (by the linking up of neighboring units) that were a primary part of modern era policy changes. However, scholars in Canada, a country where the issue of urban government structure and the need to meet changing ground conditions has been the subject of much discussion, have focused on this very subject. [See: Shen, Jianfa “Reorganizing Urban Space in Postreform China.” Meligrana, John (ed). Redrawing Local Government Boundaries: An International Study of Politics, Procedures, and Decisions, Chapter 10. University of British Columbia Press, 2004]. In reality, the implementation of these structural changes in urban territorial formulas created a cohesive territorial foundation upon which the dynamic changes of devolving authority, fiscal changes and incentives, and emerging inter-regional competition could be forged to expedite the pace of development. With 600 new cities planned by 2011, the process of urbanization remains a continuing phenomenon. It can be said that the growth of Chinese urban centers has exemplified a new twist to a tried method of permitting autonomous units within. In the United States, this method was tried first in what has become the modern path to implement city-county consolidations (the route by which several of the larger cities of the United States were established) with the Baton Rouge innovation - which became the norm thereafter where large cities were involved (as discussed in an earlier article on consolidations by this author). In this pattern, Louisville, Kentucky’s recent example allows for the highest number of autonomous units so far in such efforts in the United States. In China, the number of autonomous units permitted within the municipalities that have provincial-level status has taken this possibility to a new dimension. However, early steps were taken in the 1950s with the city governing counties mechanism; and the later option of a city governing a city phenomenon in cases where a county administered by a city was later designated a city with county-level status. Outside the United States, when local unit expansion by consolidation takes place, generally autonomous units are not allowed in the mix - as the article on recent local system consolidations in Japan revealed on this website. Notable exceptions have been Canada (in the multi-unit integrated federated examples of the 1950s that expanded urban regional systems through integration, and thereafter); France (pursuant to the inter-communal organization laws and the Marcellin Act of 1971 providing for consolidation); and in China. Urban expansion in China illustrates both respect for historical roots within and awareness of the modern evolution of urban systems outside the country. Past roots include the 1909 announced changes of the Qing Dynasty pertaining to the regulation of the designation of autonomous cities. Until the post-1978 reform era, Chinese cities had been subject to monitoring by provincial, prefecture or county governments. In the post-reform era, urban areas can have provincial, prefecture and county-level status, which reflect the great watershed of difference between the pre-reform and post-reform eras. At the time the People’s Republic was formed in 1949, the central government administered over a hundred cities. Subsequently, the People’s Republic devised its first effort to define local government in 1954 on an earlier systemic foundation. In the 1950s era, when urban migration was at the time limited by an internal passport system that restricted movement from the rural areas to the urban regions, Chinese cities were allowed to govern counties. This was when - a common feature of the United States - the separation of cities from the rural portion of a county remained the norm in China. By the late 1950s one-eighth of Chinese counties were so affected. Subsequently, this feature was nationally applied after 1983; first seeing fresh application in 1982 by Jiangsu Province. The post-reform era also saw whole counties being designated as cities, accounting for almost 70 per cent of cities. Between 1982 and 1992 their number almost doubled from 245 in 1982 to 517 in 1992. In addition, the designation of prefecture-level cities, pro-provincial and provincial-level cities has also taken place. Between 1982 and 2000, the number of prefecture level cities has more than doubled from 112 in 1982 to 244 by 2000. Pro-provincial level cities were designated for special provisions for their economic development. These included some large cities and provincial capitals, which were then singled out in the national plan. By 1994, there were 16 such cities, including Shenzhen (the subject of a 27 September 2005 article in Asia Times Online where it was stated its growth rate of 28 per cent per annum since 1980 is without equal). Of the provincial level cities the most recent is Chongqing (profiled in a 15 March 2006 article in The Guardian newspaper entitled ”Invisible City”- where it was called “the fastest-growing urban center on the planet” with 10 million new arrivals (two million more than the population of New York City) expected within 13 years in the urban core). In these changing forms of designation is revealed the urbanization philosophy of China. In the post-1978 reform era economic reasons have fuelled city designations and territorial changes, as continuous economic development has led to the need for greater urbanization. The process of designation change is usually directed from above; but, local governments can also initiate it as well. In the 1950s era the early steps were taken with the beginning of the implementation of the ‘city governing county’ formula. Thereafter, annexation of a part of/or whole of a county or city as an urban district was allowed (an example of which is the expansion of Guangzhou City); and the merger of cities (the norm being that of a county-level city and a prefecture level city) that requires re-organization of government functions in the process. In this context, the challenge of urban core interests versus rural interests has led, according to critics, to promotion of the former at the expense of the latter. The enlightened cooperation characterized by the metro regional system of Twin Cities order in the United States, which reduced disparity between better off and less well off parts significantly, is a goal that remains worthy of emulation in China. Rapid urbanization has led to the loss of arable land; and also created conflicts between farmers and local governments who implement the taking of property for development purposes. In the US, the use of Eminent Domain to spur economic growth was highlighted in the New London case, where the Supreme Court effectively held that property could be taken to spur growth to provide jobs. In China, farmers have been protesting over the loss of their land where local governments have not respected their needs in the process. The Government has still to address this issue substantively, as property rights are lacking for farmers. A property rights bill in the People’s Congress has been mired in debate over whether it aids the discrimination of the many in favor of the few; yet, this is an angle that also needs to be addressed in the rural arena - as the Indian state of West Bengal has revealed, property rights for farmers can be a productive tool. However, West Bengal lacks the types of industrial rivals for its small farmers of the Chinese order. A more balanced co-existence still eludes local regions where such conflicts take place. In the US, where the dynamic of inter-local competition has matured since the Second World War, with the growth of suburban units nationwide and integrated systems rare, fiscal fragmentation has led to competition between jurisdictions and a zero-sum game. China’s integrating urban systemic policy with its contrasting focus on greater integration between local units, may inhibit what has taken place in the US, where integrated local systems are few and far between - with the resultant competition contributing towards regional weakness and divisiveness rather than cooperation. Regional system proponents in the US have in fact promoted integrated systems to inhibit this weakness. However, the spectre of unhealthy competition is one that has potential in China, and needs to be watched. Environmental degradation has come hand-in-hand with growth in China. The spatial closeness of the population with industries has produced in China a classic challenge that urban industrialization brought in western countries. The very scale of the process in China makes the situation a greater challenge. Chinese cities need to consider that sustainable development promotes long- term growth. The large territories of China’s large cities can promote enlightened ‘green’ development. This can be less of a challenge for them than for cities in the West where land is at a premium. 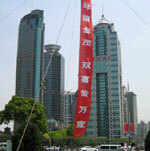 The urban core of many Chinese cities is still light, and thus provides a wedge of leverage for enlightened leaders. Despite the new housing being built for migrating masses, it has not been enough. Hence slums are developing in the fast growing regions, since migration of 150 million is difficult for any nation to accommodate. 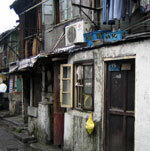 Slum growth in China is certainly not to the extent common in other developing countries. But the fact that slums exist is an indication that migration needs to be contained to reduce this development. As noted in a Habitat Jam discussion between a Kenyan researcher and a former head of India’s Hudco (Mr. Vasudevan Suresh), which this author witnessed (along with participants interested in this topic), Chinese cities still set an example for others. In the words of Mr. Suresh: ”If there are opportunities and space for everyone to grow and poverty can be alleviated, irrespective of the nature of governments, there would be scope for balanced development for the citizens and cities - the Chinese cities give good examples for this. I have had the pleasure of visiting many Chinese cities and I have always seen the inclusive approach and a sustainable city development strategy reflected.” [Source: Habitat Jam. Subject: A new tale of two cities Comment by: Mr. Vasudevan Suresh, Retired CMD, Hudco, India Date: 2005-12-03 11:05:39 UTC]. Under the 1954 Constitution of the People’s Republic of China, there would be a People’s Congress for a city, delegated with state power. Each city government would have the People’s Committee to serve as its executive arm. In this way, there would be a link between the government at the center and at the city level. The Chinese effort to link the center with the local has had as its predecessor the role of the Prefects in the French system, which has taken a long time to recede over time. Hence, one cannot say that this impulse to keep an eye on other operative levels is unique to China or for that matter limited to Communist and non-western systems. In a different context in the United States, there is the role of state-appointed members in local systems with examples as varied as the Twin Cities Metro system in Minnesota (one of the two regional systems in the United States) and the New York City Municipal Water Finance Authority, established in 1984. As noted by the Stanford scholars in their paper, since the post-1978 reforms era those appointed were chosen not for party loyalty but instead for their ability in managing local economies, with deeper roots in the localities (rather than being outside appointees) and thus with greater commitment to local prosperity. In China, an indirect rather than direct election system is adopted to elect the local administrative officers. That is, the local voters elect the representatives to the People Congresses who have the right to elect the officers of local governments, the Local Peoples’ Congress being the representative arm of the National People’s Congress at the local level. The exception is the lowest level, the residents’ committee (urban) and village committees (rural), where direct elections take place. It has been argued by some scholars that central government monitoring is weak enough to enable local government concealment of local government revenues and borrowing. Thus, despite the role of the local government leaders in China as representatives of the state, this dual-purpose role creates a conflict unlike that, for instance, in the French prefect system, where the monitoring role was dominant and duality was subordinate. In the post-1978 reform era, local governments have increasingly participated in economic construction and played an important role in rural-based industry promoting economic development. This has had a dynamic effect, as exemplified by the Pearl River Delta region, where local government played a highly interventionist role and exemplified the experimental and evolving way that local governments were used. Under this interventionist model between 1980 and 1993, the rural enterprises in the delta increased from 30,850 to 403,898. Local governments in the region directly intervened in the economy by providing favorable conditions for enterprises. Apart from managing the economy, local governments have the following functions: responsibility for culture and education; urban and rural development and construction; finance and taxation; civil administration; social security and public order; medical and health affairs; and other functions. In the pre-1978 era, urban community organizations were work-based. The main mechanism was the Danwei (work unit). But in the period of market reforms and migration, an ever-increasing number of migrants and the unemployed (including retrenched labor) came outside their ambit. Hence, from the 1980s, efforts were made to upgrade residents’ committees that have existed since the 1950s. The most recent upgrade experiment is in the shequ mechanisms. In the urban cores, below the people’s congress, lie the street offices (an administrative organ) and below that self-governing mass organizations of residents’ committees. As noted by this author in articles discussing integrated federated systemic variations, administrative offices below the city level are a rising phenomenon. They have been applied in Birmingham, UK; Japan’s consolidated local systems; Sydney, Australia; Los Angeles, California; Hamburg and Berlin, Germany; and Seoul, South Korea. They are also a feature of mainland Chinese cities and of Taipei (declared a centrally administered city for the Republic of China in post 1940’s era), which has city district offices run by a director. The shequs have more residents and are geographically larger than residents’ committees, and have more control over their affairs. A growing number have directly elected their leaders. Three general models had emerged in this evolving picture by 2002. These were the Shanghai, the Shenyang and the Wuhan models. In the Shanghai model, shequs get delegated responsibilities, with decision-making powers in the street office level mechanim. In this model, policy framing is the purview of levels above the shequ with the shequ having the role of the implementor. In this model the system is weighted in favor of improving city magement over citizen particpation. In the Shenyang model, the shequ have a policy-making role and are a separate level of government governed by a community council. Within this community council are four groups: a party leadership group, a government representatives group, a community self-government group (representing residents, institutions such as schools, and businesses) and a management committee, which is often directly elected. The Wuhan model is a hybrid version of the other two types. In this model, the shequ priorities are determined by the local government - but they get additional resources and some autonomy in implementing policy. Outside these models is an experimental example, such as Qingdao’s, where shequs have been given autonomy from the street office level.This model features encouraging civic involvement via the Community Democratic Consultation Council (CDCC) whose membership embraces local business repesentation, interest groups, schools, representatives from the community, the Communist Party, and the residents’ committees. Its members are appointed, but in future their direct election is contemplated. In this model the bureaucracy presence is reduced as this sheque type was implemented in place of a street level office served by Ministry of Local Affairs personnel. This is one reason that this model is not promoted as a model more widely. [See: Jim Derleth and Daniel Koldyk .“Community development and political reform in urban China.” China Development Brief. October 1, 2002. Those readers familiar with the evolution in other countries of neighborhood councils, parish councils and citizen community boards and the like, will understand that in this context the evolution of shequs is still in search of a defined solution. In integrated federated units outside China, a combination of directly elected neigborhood councils and citizen oragnizations with dedicated amounts of funds providing for development use is already in place in one country. This offers a more defined connection between offical government and civic oriented citizens that the Chinese models have taken steps towards. Perhaps, the evolution of the shequs may define itself in that direction. However, as it stands curently the evolutionary direction of shequs is an open question, limited only by the opportunity and creativity of those empowered to try different appraoches. The experimental nature of the process illustrates how creativity is allowed to function in the Chinese system. In fact, with the evolving role of the shequ, China’s local system evolution illustrates that greater systemic integration, simplification and further decentralization remains the potential of this system in times to come. *Mayraj Fahim, the author of this article, is a local government adviser. Her occupational focus in local government has been in the areas of municipal finance in the United States and in municipal finance monitoring internationally. She also advises on local government reorganization in the United States and internationally. The full version of this article can be obtained free of charge by emailing the editor. The collective experiences of France, Canada, the UK, US, Singapore and India’s West Bengal offer instructive lessons on how to unlock the potential of substantive federated local government systemic frameworks - as well as offering demonstrative evidence of either successful or problematic adaptations. In an era when even regions with no history of applying the methodology are endeavouring to establish such a framework, such as the most populous region of the Netherlands (the subject of the Declaration Deltametropolis -1998), one may wish to consider the broader ramifications of undertaking this process productively.